Within the field of rubber and O-ring test method, ERIKS is leading for practical all industries. The company has decades of experience with all types of O-rings and has been testing these products to make sure quality stays as high as possible. 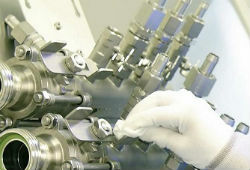 Companies like ERIKS design and develop specific O-ring and rubber parts, often in close cooperation with the client. A O-ring test method can give answers to which O-ring should be used in a certain condition. Besides the standard O-ring test method ERIKS is also able to personalise the o-ring test method with specific requirements from the customer. If your have any questions about the possibilities fill in our "ASK ERIKS" form on the right. Questions about the O-ring test method? For more information about our ring test method, please fill out our "ASK ERIKS" form on the right and we will help you with all your questions.